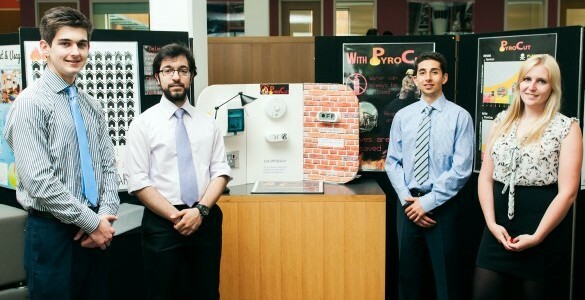 The show is the culmination of team-based projects in which the MET IIA students find a design-based solution to a problem, create a marketing plan and present their ideas to their peers. 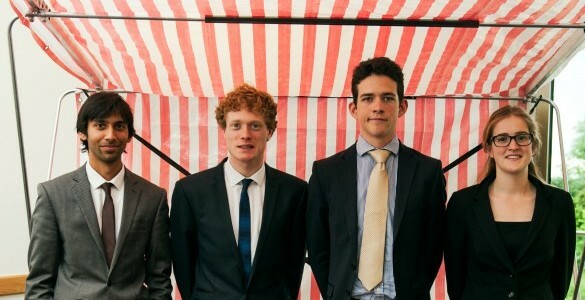 The 10 projects this year covered social entrepreneurship, safety, health, sport and more. 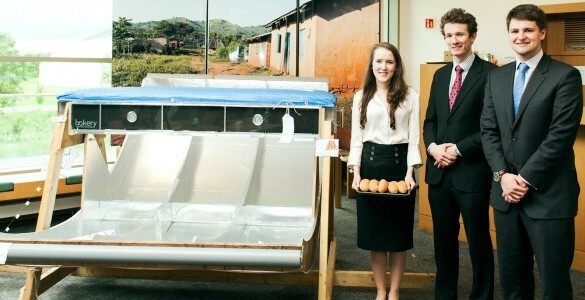 A solar bakery for equatorial countries which autonomously tracks the sun and ventilates to provide a constant baking temperature. Infinity Bakery plans to work with charities to provide ovens that allow existing bakeries to switch from firewood to solar power, and partner with micro-financiers to empower groups of entrepreneurs trained at these bakeries to set up satellite bakeries. The oven mimics the baking times of a fire and requires no additional input, as a self-tracking and temperature regulating solution. A low-cost prosthetic wrist joint. 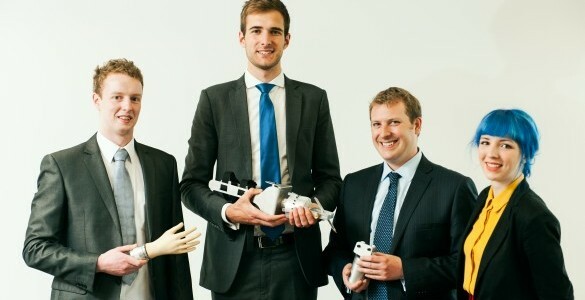 FlexiWRIST Prosthetics aims to revolutionise wrist technology. By adding a small technological improvement to the design, large improvements in functionality can be achieved, resulting in more natural movement for certain tasks. The FlexiWRIST is unique in that it uses silicone rubber to provide certain motions passively and offers a simple return mechanism. A shelter for refugees and those who have lost their homes in disaster areas. It has the unique ability to tessellate with other shelters to build communities. The Hive Aid shelter centres on the provision of uniquely designed poles as a framework onto which panels are slotted. Each plastic pole comes from the same extrusion, and has three flexible slots to connect the panels at a range of angles. They are extruded in the UK then transported to the site alongside other emergency supplies such as food, medication and clothing. 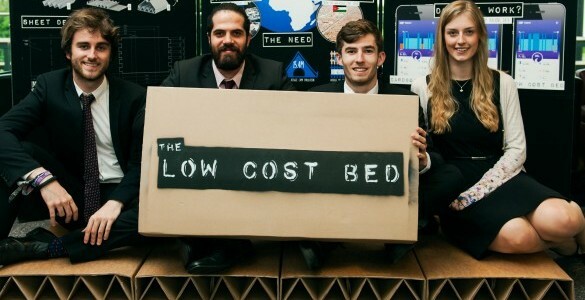 A solution to ultra-low cost sleeping to ensure that everyone has access to a bed. The bed is designed for use in homeless shelters in the UK, particularly during winter when bed shortages occur, as many can be stored by day and placed on the floor at night. It is also designed for disaster relief situations where the immediate needs of people have been met, providing an additional level of comfort and tackle problems caused by sleeping on damp or hard ground. The bed will fold flat for transport and storage, is water resistant for damp or humid conditions. A platform to control the physical environment which acts as a portable sensory room to calm children with ASD. 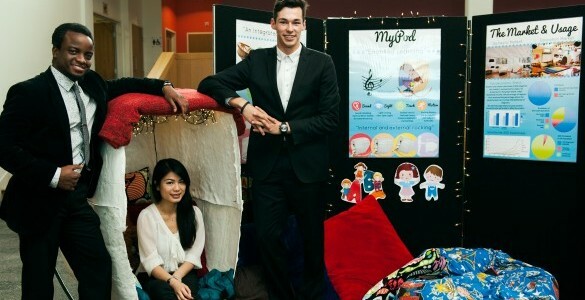 MyPod’s main function is to offer relaxation techniques in the form of rocking and pressure application, both of which are techniques that have been validated by psychologists. The sensory pod can be rocked externally by a teacher or parent, which makes for easy interaction during the calming period. Rocking can also be generated internally, by the users themselves so they can feel independent if they want to. To facilitate its use in the classroom, MyPod aims to offer sensory reduction, mainly in the form of sound cancelling and light channelling to reduce distractions. Making skiing more accessible for the blind and partially sighted through use of tactile feedback in the ski poles. The Piste Pilot is designed to be picked up by a blind skier on holiday with a sighted friend using an interface that can be mastered quickly. The product will be provided as four integrated ski poles – two for the guide and two for the skier with sight loss. The skier will receive vibrations in their ski poles, triggered by a series of button presses from the guide on their own poles. The information given will include direction, how hard to turn and when to start/stop. This will be achieved wirelessly using radio communications. Aiming to save lives by reducing fire service response times. PyroCut automatically isolates the power supply in the event of a fire. Once a fire has been detected, there is a three-minute time delay before the power is isolated, ensuring sufficient time for the occupants of a dwelling to exit, as well as allowing them sufficient time to address a false alarm. Once these three minutes have elapsed, the power is isolated and a signalling device is activated. This device demonstrates to the fire service that the power is off and water can be used to tackle the fire. A pill dispenser for those starting to encounter cognitive or physical difficulties with their self-administration of medication. 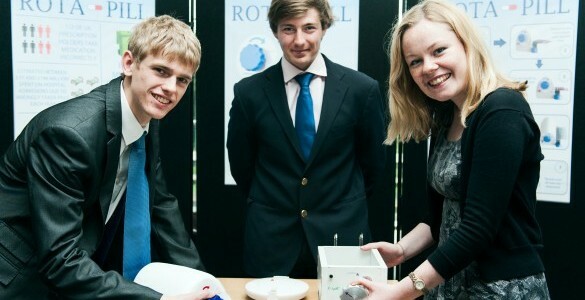 The Rota-Pill dispenses medication directly from personalised blister packs filled for patients at the pharmacist. The user must simply turn the dial to the current time and pills intended to be taken then will be dispensed into a cup for easy consumption. The simple mechanical system combined with smart use of ergonomic principles makes the Rota-Pill easy to use and will prolong the independence of users. A ski lock which is directly integrated into the ski brakes. 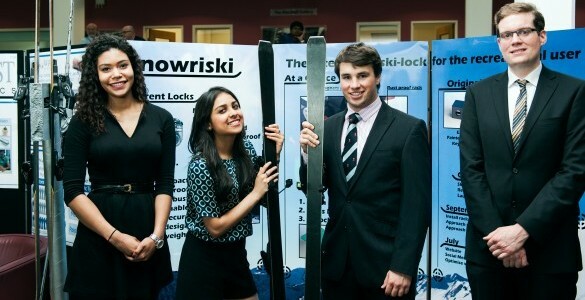 Snowriski has designed an innovative locking mechanism for a pair of skis. This new design is built within the skis themselves, relieving the skier of carrying the lock around or forgetting to take it along in the first place. With ski theft becoming an increasing problem in ski resorts across the world, this lock is more than a deterrent. Its robust and compact design locks the brakes on one ski to the other around a uniquely compatible Snowriski rack. In addition to these features, this lock is designed to be waterproof and iceproof, unlike those on the market today. A rapidly deployable market stall for Cambridge’s historic outdoor market. 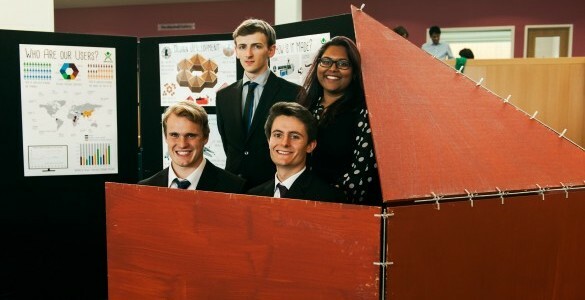 It can be set up in less than 15 minutes, is aesthetically pleasing and made using material and labour sourced as locally to Cambridge as possible. It collapses into a bench, providing storage space for stallholders, seating for the public and turning the square into mostly open space. The benches can be fork-lifted away to free the square completely. The spacing between the stalls can be modified to facilitate van access.